If you are in need of professional and reliable Bosnian translation services, look no further. Sydney Translations have Bosnian NAATI certified translators to help translate your texts and official documents. We have Bosnian translation services for immigration, visa, business, and legal purposes. Most Australian departments and authorities require Bosnian translations to be accredited by Bosnian NAATI certified translators. We are proud to have highly skilled translators to handle your translation projects. 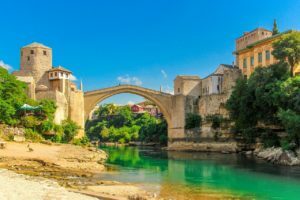 Avail of our Bosnian translation services today and get to know why hundreds of our clients keep coming back for their Bosnian translation needs. We have Bosnian translators and project managers who pay great attention to details and thoroughly inspect documents for translation. Our Bosnian NAATI translators strive to finish your Bosnian translators quickly without compromising the translation’s quality. Sydney Translations provides the most affordable prices in the city. For your queries, you can get in touch via the online free quote form or the Live Chat. We guarantee a 100 percent acceptance rate of your NAATI translations by Australian authorities requiring NAATI translations. You don’t have to come to our office to order your translation or to get a quotation. Simply send us your Bosnian documents via the online form on this website. All of our transactions can be done online using our efficient and trusted Bosnian translation services. Upload a copy of your document using the quick translation quote form found on this page. Receive an email containing the translation price for your document and more information in just 15 minutes for FREE. Our translation price starts at only AU $69. Pay using PayPal, online banking or credit card. We will ask you to review and approve the finished draft of your translation. If approved, you will get your translation through email. We will send a certified hard copy by post if needed. How long can you finish my Bosnian translation? Standard turnaround time for translations is 2 to 3 days. We also provide 24-hour express Bosnian translation services for urgent translations. Let us know if you want to avail of our standard or urgent Bosnian translation services. Get in touch via the Live Chat or the online translation form. What is NAATI? Why do I need it? NAATI stands for National Accreditation Authority for Translators and Interpreters Ltd. It is the accreditation body and national standards for both interpreters and translators in Australia. NAATI translations are preferred in Australia because of its quality and accuracy. Our NAATI certified translators have undergone a series of tests to be accredited so you are confident that you will only receive high-quality Bosnian translation services when you work with us. The Bosnian language is mostly used by Bosniaks and is among the three official languages of Herzegovina and Bosnia. It is quite similar to Croatian, Serbian and Russian. The language used to be written with the use of Cyrillic alphabet. Today, this is rarely used. The Bosnian language is a standardised variety of the Serbo-Croatian family of languages. Currently, there are more than 2 million speakers of the Bosnian language around the world.